The Reserve Bank of India released its ‘Quarterly Statistics on Deposits and Credit of Scheduled 2008’. The publication contains data relating to deposits and credit of scheduled commercial banks including (RRBs) as on March 31, 2008. In the last report Belgaum stood at 76th place in both credit and deposit base, i.e.Dec 2007. 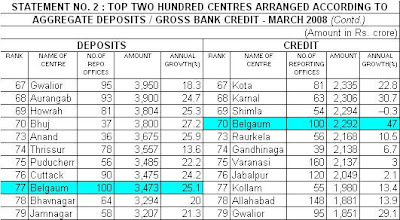 In the next quarter Belgaum deposit base has come down by 1 place to 77 and the credit base has gone up 6 places to 70th position. Belgaum is still at Fifth place in Karnataka after Bangalore, Mangalore, Mysore & Hubli. No other site or even news paper cover this, but as Belgaumites we should know where we stand and all the big companies who plan to start any kind of operations here see these kind of reports and make their plans, hence I thought it fit to post this here. Note: ‘Quarterly Statistics on Deposits and Credit of Scheduled Commercial Banks’ provides data on aggregate credit of scheduled commercial banks as on March 31, 2008. The data are based on Basic Statistical Return the branches of all scheduled commercial banks (including RRBs). The % annual growth is promising!! Hope the trend continues and belguam climbs up the rung.